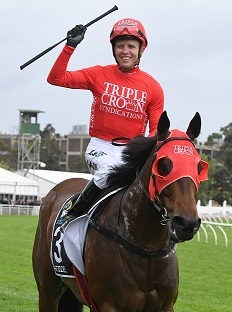 Kerrin McEvoy will happily play the role of stalker on board Redzel, if required, in the highly anticipated ‘mini-Everest’ clash with Invincible Star at Royal Randwick on Saturday. The Everest champ Redzel returns in the Concorde Stakes. (Pic: Steve Hart). The defending Everest champ is widely expected to have the job of running down the speedy mare in the Group 3 $160,000 Concorde Stakes (1000m) and that suits McEvoy nicely. “She’s a smart individual and she’s been running nice sharp time in her trials so I wouldn’t want to be taking her lightly,’’ McEvoy said. “It’s going to be helterskelter over 1000m you’d imagine with quick horses but I’m looking forward to him getting back to the races. In that Challenge Stakes, Redzel ran a last 600m of 32.11 (Punters Intel) as he broke the 1000m course record at Randwick. He also holds the 1100m record, set in The Shorts last year. The Concorde has been billed as a match race between Redzel ($1.70 with TAB) and the latest of the 10 confirmed Everest runners Invincible Star ($2.30) and the result will have an impact on the market for the $13 million feature. Redzel is $6 second favourite, Invincible Star $15. The six-year-old reacted to his blinkers going on in his second trial, at Randwick on August 20, by winning comfortably. There’s no doubt Redzel was at the top of his game when he won the inaugural Everest so the big question is – does he need to be better in 2018 to successfully defend his crown? “I haven’t lost any admiration for him at all, put it this way he’s definitely going at least as well (as last year),’’ McEvoy said. “He’s a nice and relaxed individual for a sprinter but he gets up and does his work when he knows it’s game time. Of course, Redzel won the Concorde last year and he’s following an identical path to The Everest with the Group 2 The Shorts (1100m) on September 15. It’s just six weeks on Saturday until the grand final, the $13 million TAB Everest (1200m) at Royal Randwick on October 13. McEvoy has a number of strong winning chances on Saturday highlighted by boom colt More Sundays and exciting filly Miss Fabulass. More Sundays (Race 1, $2.10): “He gave a really good feel in the trial. He used himself nicely when I asked him. It’s a tougher race than his first-up win but the horse is promising a lot. Miss Fabulass (Race 8, $3.50): “Even though we were leading (first-up) she got into a nice rhythm and used herself well. In an ideal world we would get some nice cover, I think the bigger track will suit her as well. She will enjoy further and once she gets ground with a bit of sting out it will suit her even more. “A lot of these fillies have had a solid racing prep, we’re still learning about her and teaching her.